I started blogging in 2001 for the following reasons. The web was so new (to me) and fascinating. I wanted to learn HTML and later CSS. It was an easy way to inform my friends & family who lived in other places of my daily life and to keep that history for myself. I had been reading other people’s blogs and felt it was only fair if I produced as well as consumed. I had no idea at the time that it would change my life. Blogging has given me friendships that I would never had otherwise. I’m so blessed by those friendships. In 2001, blogging was simply a place to share personal stuff with other people. In 2008, blogging is business. Change is the only constant. 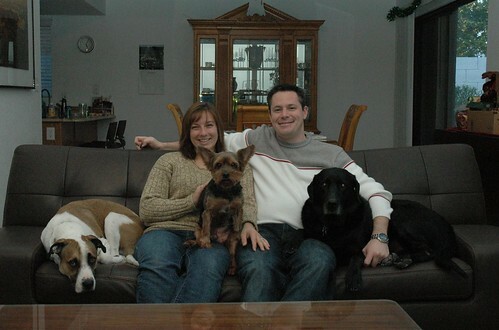 I’m married to Chris Altman and we live in Phoenix, Arizona, with our three dogs – Stewie, Bentley, & Mac. We both grew up in Arlington, Texas, where we went to high school together. We started dating after our ten-year high school reunion and got married in May 2008. I have two sisters who are also on the web – Karen & Kristen. I guess blogging changed more than just my life; the lives around me as well. Chris and I are getting more and more into riding bicycles. We’re lucky to live in a city with a wonderful network of bike lanes and paths. (I love Phoenix.) We also love making things. Chris does woodworking and I like to sew. We both love to learn new things so there’s always a project going on around here. Currently I work for OpenRain, a company that excels in web design, web development, web marketing, and mobile application development. My role is a mix of project management, customer service, and consulting. I love being close to technology and daily interaction with the developers. I also love our customers! If you want to know more about my work and education, just ask! I’m especially proud of my bachelors in fine art from Texas Tech University and MBA from Southern Methodist University. Contact me if you’re interested in my resume and previous job history. This entry was posted in Daily on February 1, 2008 by ericalucci.